Day 02: Morning (9 a.m.) Visit Swayambhunath (the stupa believed to be over 2,000 years old) - the most profound expression of Buddhist symbolism in Nepal and possibly in the world. Visit Katmandu Palace Square including nine - storey Basantapur Tower with outstanding wood carving; Taleju Temple; Kasthamandap - built from the wood of a single tree; and Kumarichwok - abode of living goddess, Kumari. Afternoon (2 p. m.) Visit Bhaktapur Palace Square: main places of visit are Golden Gate; the Palace of Fifty Five Windows - a unique masterpiece of wood carving; Nyatapola Temple - the tallest pagoda temple with its massive structure and subtle workmanship. 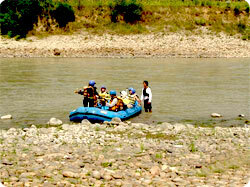 Day 04: Morning (8 a.m.) Take a canoe ride down the Rapti River and return on foot through jungle. Afternoon (1 p.m.)Take elephant ride to see great one horned rhinoceros, leopards, sloth bears, the endangered Gharial Crocodiles and Royal Bengal Tigers. Watch Tharu stick dance in the evening. Day 05: Morning (6 a.m.) The guide escorts to the bird watching site where one can view more than 450 species of exotic birds. After breakfast, drive back to Katmandu.